Anyone who knows me knows that I'm very sentimental. And emotional. And I love my family. And photos. And photos of my family ~~ we've gotten family pictures done every year since my firstborn was one. He's 12 now, so that's lots of family photos. One of my BFFs is a professional photographer, so she's been doing our photos for about 3 or 4 years now. I happen to think she does a wonderful job, so it was an easy task choosing which photo I wanted to put to canvas. As you can imagine, when I was offered a chance to try out a 16 x 20 Photo canvas, I jumped at that chance! 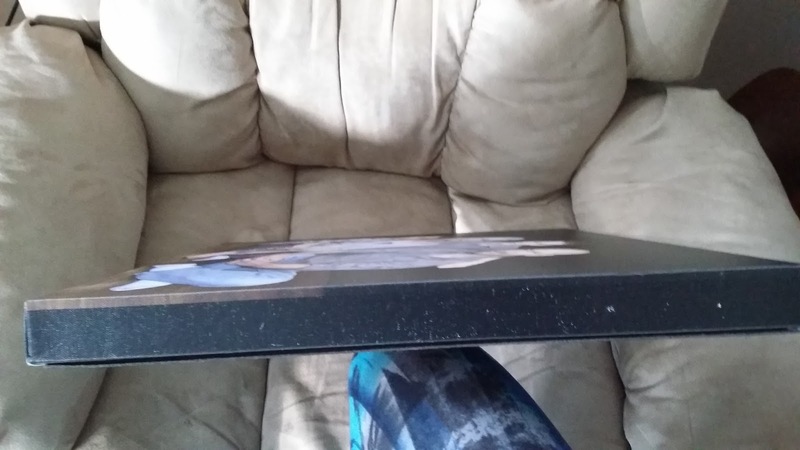 I was allowed to get a 16 x 20 photo canvas from Canvas Factory for free in order to do this review. All opinions, as always are completely my own. 1. 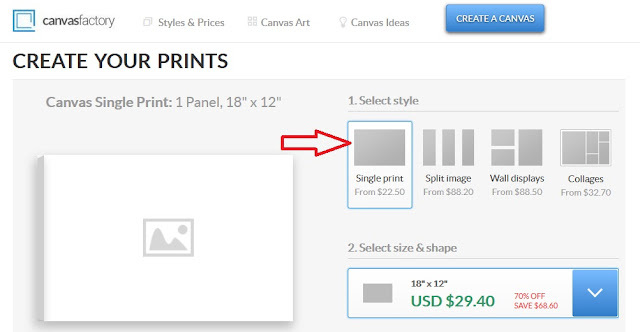 Go to Canvas Factory and click on "Create a Canvas"
4. Then, while on the same page, choose "Size & Shape" and hit continue. I was allowed to try out a 16 x 20. (Mine is actually a 20 x 16 because of the direction that I needed it) That's the size they are allowing me to host a giveaway for as well. 5. Upload a photo from your computer. Then drag and drop the picture you want into the little rectangle. 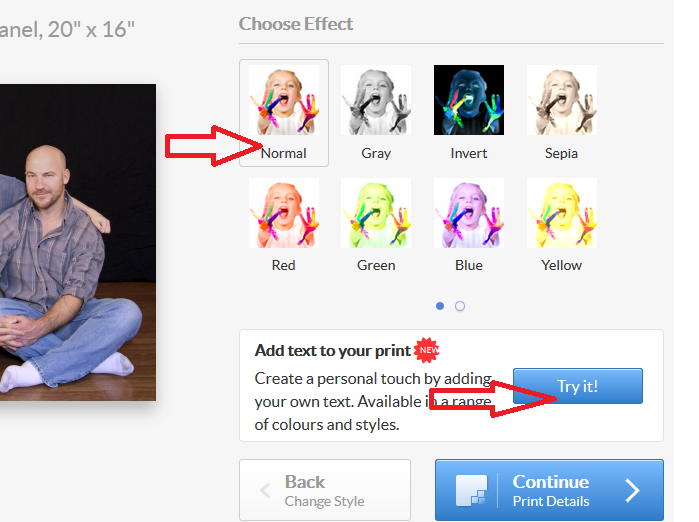 You can adjust the exact position from there. 6. Hit "Continue" to choose style. 7. Choose your wrap style. I chose the colored wrap so that I could have black on all the edges. 8. Choose "effect." We just went with "normal." You can also choose to add text at this point. I added the year so that I could see how "text" worked. 9. 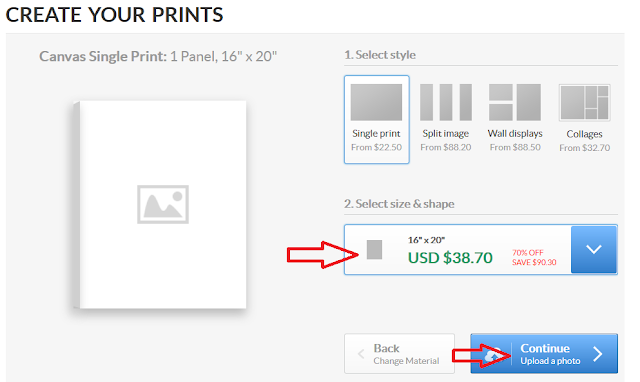 At this point, it will give you your print details and give you the option of adding it to your cart. 10. Pay and you're all done! I ordered mine on December 16, 2016. It was supposed to ship on December 20, 2016 and I received it on December 23, 2016. 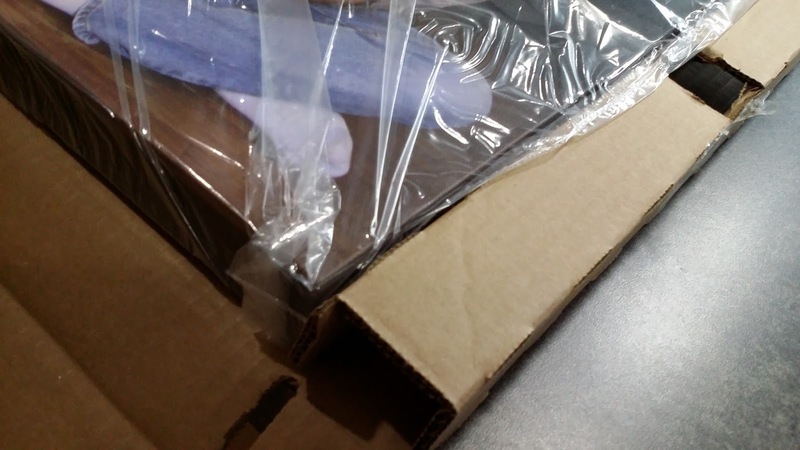 It came wrapped in plastic and packaged in a box. It got here in pretty decent shape. 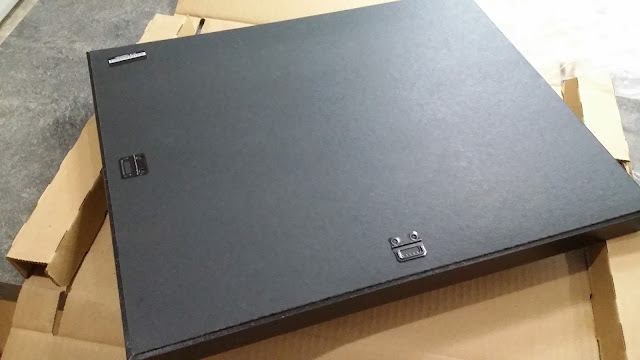 The only issue I have is that some of the black parts of the canvas are scuffed or something. White is showing through. Other than that, I love this canvas and I'm pretty impressed. The back has a solid piece on back so that the canvas is not open in back. It has a hanger attached so that you can hang it on a nail. 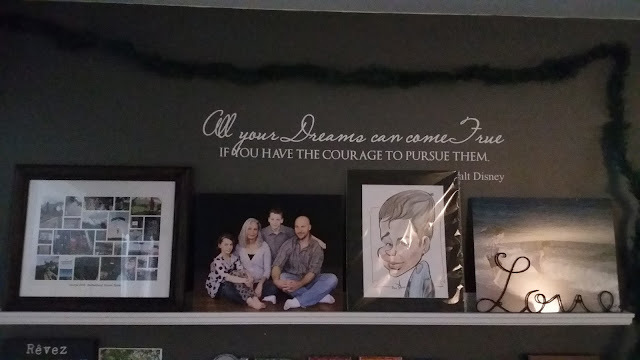 I think it makes an awesome addition to our "family dream wall." I love it. I think the price is very reasonable for this size. Right now, this size is selling for $38.70 plus tax. Shipping is never more than $9.95 and shipping is free on orders of $100.00 or more. 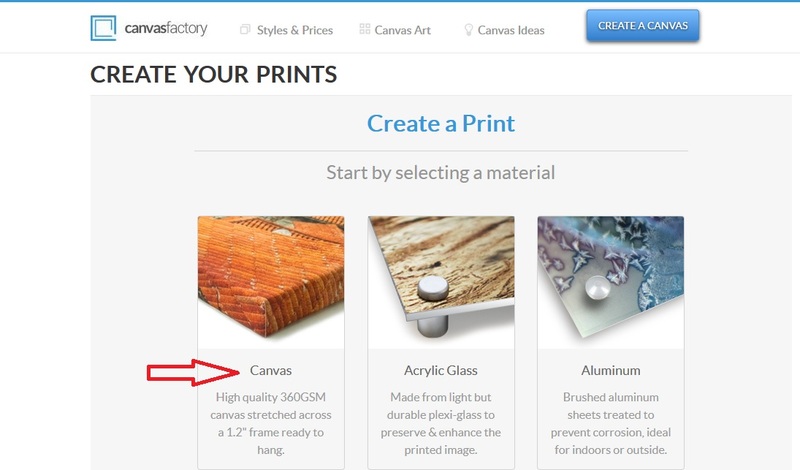 Make sure you check out all the cool things you can do at Canvasfactory.com. 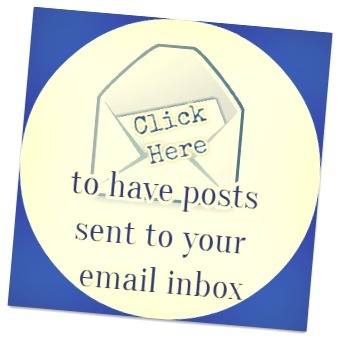 You can also follow Canvas Factory on Facebook, Google+ and Pinterest. They are allowing me to give away ONE 16 x 20 canvas to one lucky reader. Giveaway is open to residents of US and Canada who are 18 years or older. Giveaway will run from January 4, 2017 until January 25, 2017 at 11:59 PM EST. You may enter through the Giveaway Tools Widget below! 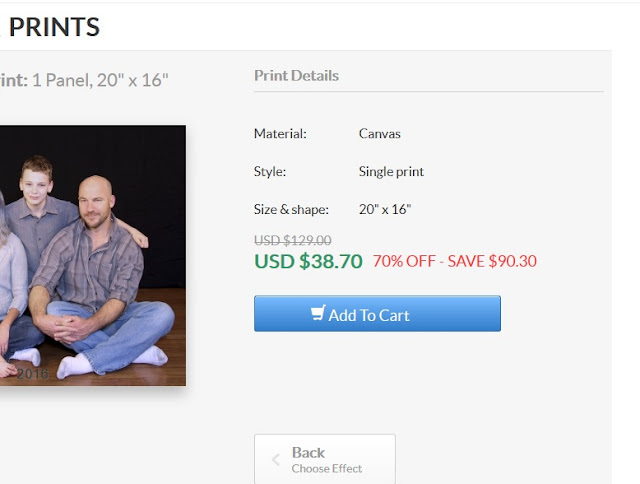 I would love to keep the photo of all my four boys together with their dad in a 16x20 canvas forever! That sounds like an awesome keepsake! Thanks for entering! I'd love to have photo canvas of our new grandchild. Congrats on your new addition to your family! A new grandchild would make a great subject for a canvas! Good Luck in the Giveaway and thanks for entering! My sister is getting married on January 25th so I would gift this to her to use for a wedding photo. Would love to have one of all 8 kids. I would love a canvas of my grandsons. I would love to have a picture of all 4 of my kids made into a canvas. 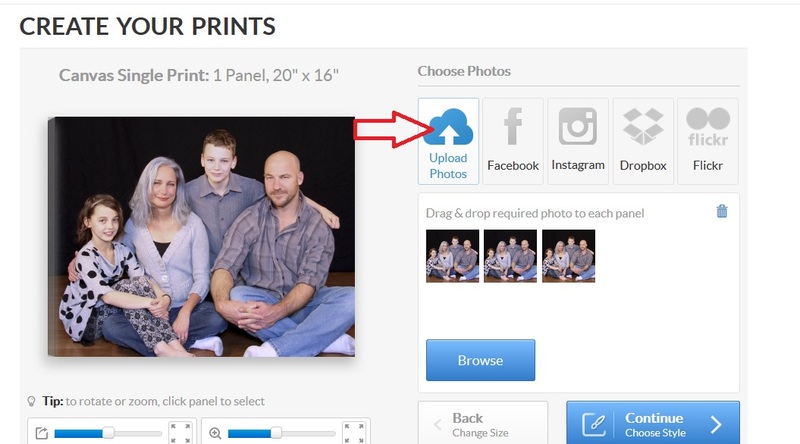 I'd use a family picture I just had taken. How cool & great photo! I've always wanted to try this company out. Would love to see how my photos look on the glass or aluminum. I want a picture of my son's family. I don't have one. 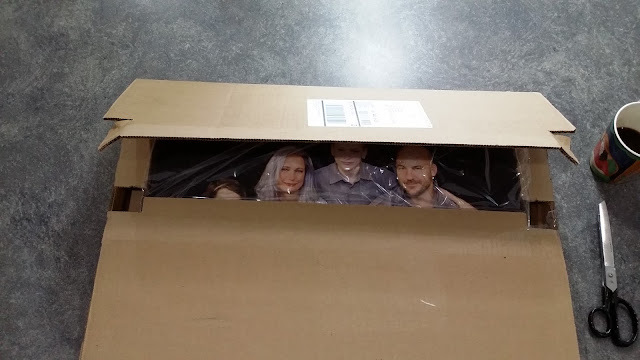 I'd like a picture of my 4 kids to give to grandpa for his upcoming birthday. I would love to keep a photo of my entire family taken at my stepbrothers wedding. 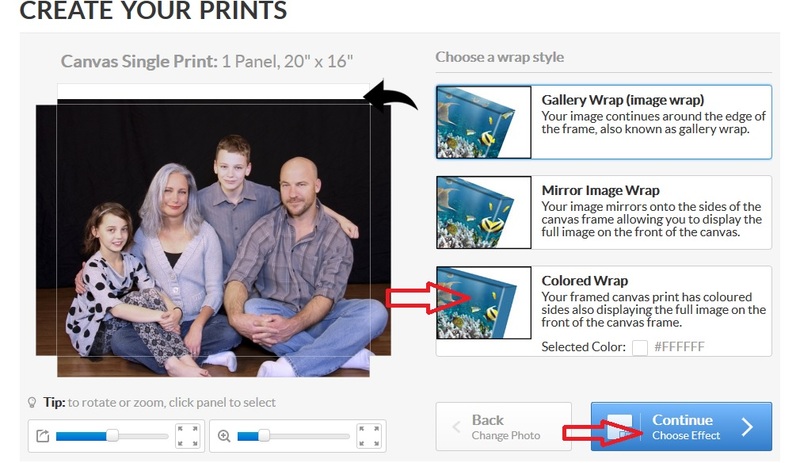 I want to keep a family portrait on canvas! Love the look of it! So classy! I would love to get our family photo taken on vacation in South Dakota on 16 x 20 canvas! 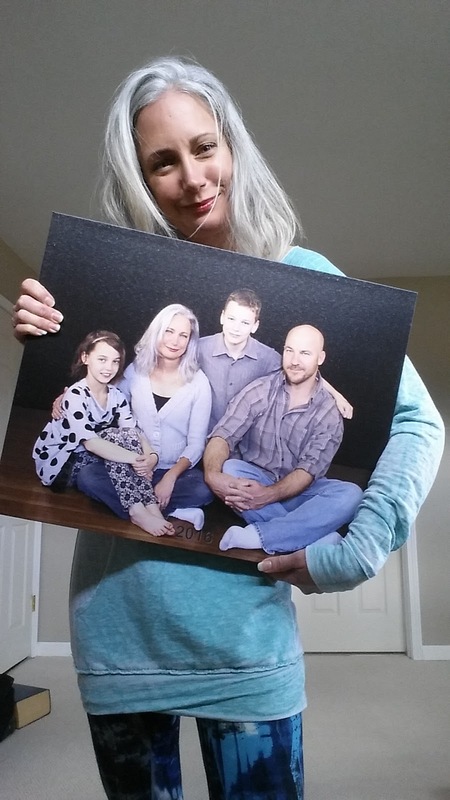 I would love to have a canvas print of my family. I'd like a photo of a bunch of relatives taken at my cousin's wedding. A photo of my aunt and daughter! My 1st Grandchild, a beautiful girl just turned 1yrs end of November & now a 2nd, her sister was just born TODAY!! My husband is an avid photographer. I'd surprise him with one of his photos. First, I would get a family photo taken. (All the photos posted in my home are of 10 years ago!) Then, I would use one of those family photos for this canvas. 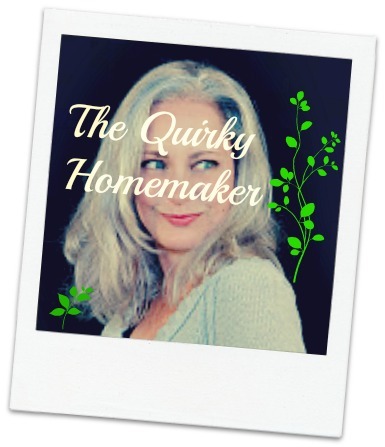 Cool product, neat prize! I would love a picture of the lake we camp at every year. I have a wonderful picture of me and my family and our potbelly pig that I would get as a canvas. Thank you! I would love to get our family photo on canvas or a vacation photo from Florida. Would like a photo of my cat! I have a photo from my mom of when she was in nursing school in her 20's and it is my absolute fave photo of her! I'd use the photo of my kids playing barefoot in a creek. It's one of my fave. I would like to keep a photo of my gramma forever! She has passed and I miss her everyday!! I would love to put one of our wedding photos on this! I'd love one of my children. I would like to have a picture of my son on canvas. I just got the most gorgeous photo of my kids over the holidays which I'd love in a 16x20 canvas! I would like to keep our beach vacation photo forever. I would keep one of my wedding photos. I would like to keep a photo of my family. A photo of my house in the 1800s. It is an old Victorian. I would like to use my daughter's first Christmas photo! I would do a picture of my daughter and me!